What’s Coming in the Next FeedDemon? 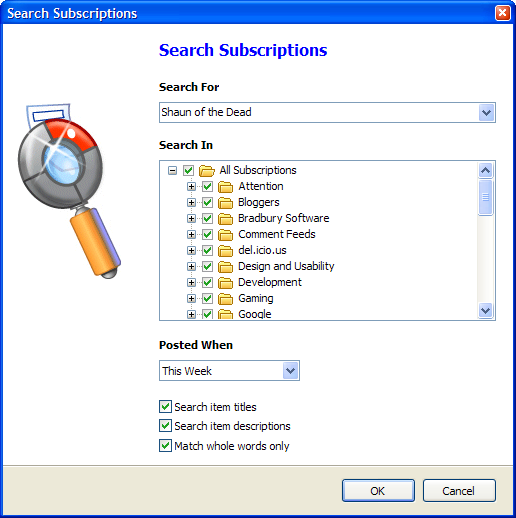 Search tweaks: The subscription search can be limited to a specific date range (screenshot), so you can search for items in subscribed feeds that were posted today, yesterday, this week, etc. And as I mentioned earlier, the address and search boxes are being combined (this small UI change not only conserves space, but it’s also pretty useful). Dinosaurs report: First seen in NetNewsWire, this feature shows you the feeds that haven’t updated in a while – great for pruning your subscriptions of inactive feeds (cropped screenshot). I’m still in “development mode” (also known as “mad scientist mode”), so expect to see other improvements in addition to these. Next Will Google Reader Give You Your Attention Data? It would be great if we could take all the dinosaurs and move them to another channel group so that they’re not totally deleted, just moved out of sight. I tried reading offline on my laptop and then resynchronizing with my desktop over the holidays, but it didn’t actually work all that well. In particular, it seemed as if a lot of posts that I read on my laptop didn’t get marked read on my desktop even after synchronizing both (first the laptop, then the desktop). Is there anything I can do to further diagnose those issues? I’m assuming that this stuff should Just Work. The good news is that we have a change in place to expand this capability to allow for greater sync transparency, it should be available soon, and won’t require you to do anything at your end, it will just start syncing more posts. Changed: The ability to embed the Mozilla control has been dropped. Sorry to have to do this, but the Mozilla Control is no longer being developed, and it doesn’t support the features added to newspapers in this version. I’m using NewsGator, FeedDemon (on home and work machines) and NewsGator Go! I like the ability to synch to a central source, but I have the following requests/comments. 1. News Bins are local – it would be great if I could synch them. 2. NewsGator Go! – I would like the ability to flag content and possibly e-mail entries to others or store them locally for future reference. The feature *is* needed, because in Unread Feed View you can not tell whether a feed hasn’t been unpdated for a day, a week, a month or since the beginning. Having got 200 feeds or more there is no way to find not updated (in a month’s time, or so) ones if you read/skim (and mark as read) all other feeds daily (or weekly).